Discussion in 'DC Costumes and Props' started by Master Dahark, Oct 20, 2011. As Halloween is fast approaching, I threw on the Bat tights to see if I was still in 'passable shape' and to see how my NEW cowl looks. What do you think?? I sure wish I had one of those 'spide4fun' suits.... but for now I'll just have to use my own bod-- and good lighting, lol! And here's my latex/ fabric cowl. COMPLETE neck movement! Did you make the costume yourself in the first place, or? Well, if it helps any, I looked at the pictures before reading what you've written and wondered if you were using muscle padding. 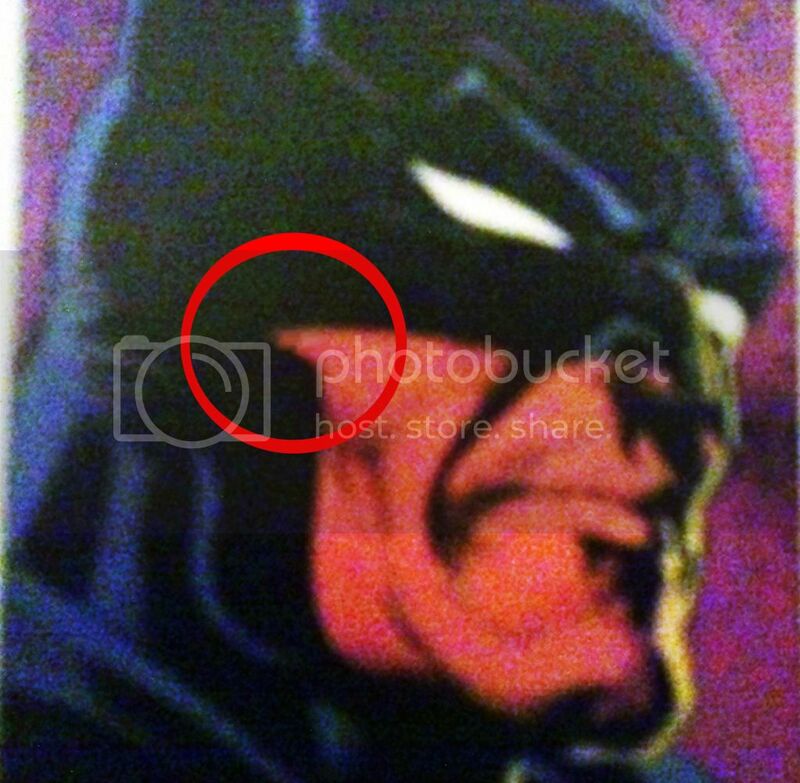 I like the way the cowl connects to the cape. I personally, have not been a fan of any of the white out eyes I've seen... but that's sort of personally opinion. It is closer to the comics, to be sure. Awesome suit man, what fabric did you use for the eyes? this remind me the predator vs batman video excellent job!!! I personally, have not been a fan of any of the white out eyes I've seen... but that's sort of personally opinion. It is closer to the comics, to be sure. Yeah, when I go out I may end up doing the black makeup-- I was just figuring that eventually I might want to take the mask off, and I didn't want to look like a raccoon, you know? The eye mesh looks great. One thing I was thinking was, what if you put some black material over the mesh and cut out eye holes, making the white area appear smaller? Basically, the same thing you do with make up, covering up skin, but this time you cover up some of the white. 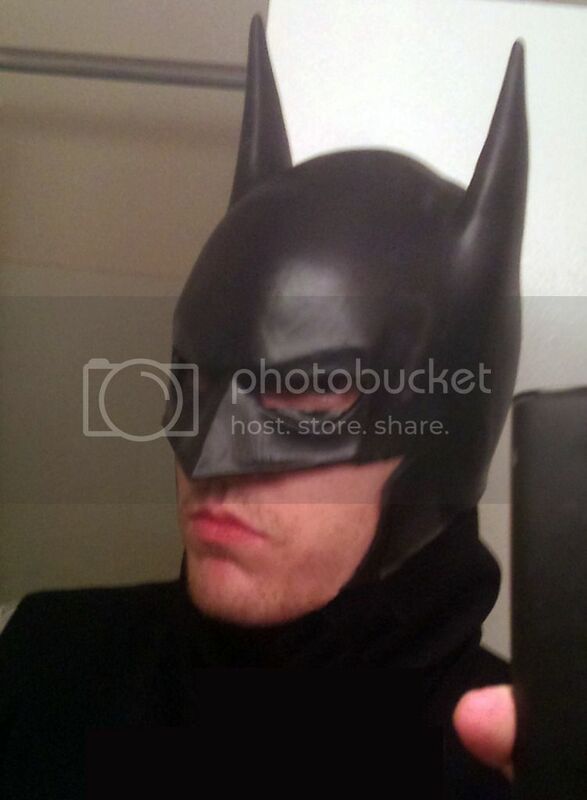 Great suit bud, and I have to agree that the cowl joins your cape very well! So I fixed the eyes like you suggested! Not *exactly* like in the photoshopped pic, but close-- HELL of an improvement! So here's how Bats ended up! Very happy with how the eyes turned out! Thanks for the suggestions! Nice! The eyes came out great, as did the whole costume. Great job, citizen! The white eyes came out good. Awesome design. It came out great. Plus, you're in the right shape for it. Great job! Your suit turned out great! 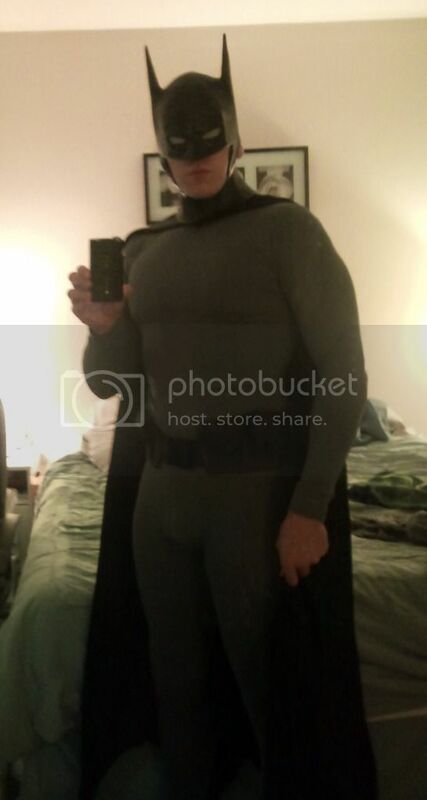 My girlfriend went out for the evening so I decided to try on my suit :lol If she only knew my double identity!!! Going for more of a 'New 52'/ 'Earth One' look this time around. 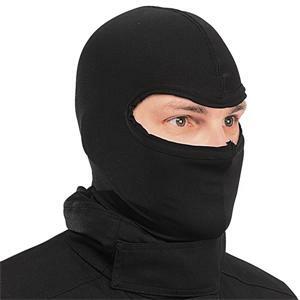 I will have a black balaclava under my mask (just hasn't arrived yet) so you won't actually be seeing my earlobes sticking out of the bottom, lol.